Fear is defined as a feeling of agitation and anxiety caused by the presence or imminence of danger. Though there may be many sources and effects of fear, there is a particular fear related specifically to practitioners of Yoga meditation, as well as other meditative and contemplative practices or traditions. Many sincere seekers of direct experience of subtler realities seem to have a pervasive fear stemming from the negative influences of two polar opposites: the Theists and Religionists, and the Atheists and Secularists. 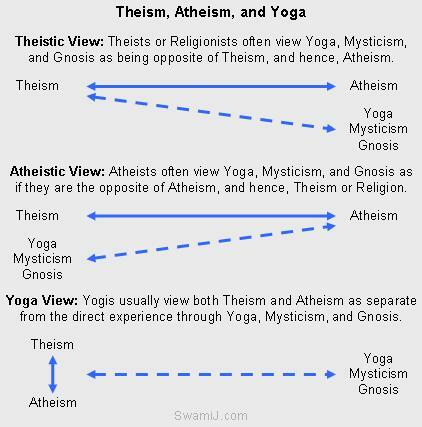 In America, some Theists or Religionists view Yoga (as well as Mysticism and Gnosis) as being in opposition to their individual form of Theism, and hence, see it as in alignment with Atheism. Some Secular Atheists view the Yoga practices of meditation and contemplation as being part of Theism or Religion. At the same time, however, practitioners of authentic, traditional Yoga usually view both Theism and Atheism as separate from the direct experience sought through these practices. The often imperceptible fear of the Theists, Religionists, Atheists, and Secularists can be a major obstacle in sadhana or spiritual practices by virtue of the fact that the sadhaka (practitioner) is "going against" the subtle pressures of the human environment. The effect of this fear can be an unconscious reticence to pursue the deeper teachings, or to explore and surrender into the subtler processes such as with advanced meditation or contemplation. Or, the fear may be strong enough to completely stop you on your inner journey of enlightenment, even though it may remain undetected by the conscious mind. Now, it is important to note that these observations are not intended to make a sweeping generalization about all Theists or all Atheists, most of whom are likely very genuine and well-intentioned people. While there may be some who are individually quite aggressive and destructive in their belief based actions, most are probably just living day-to-day lives, only indirectly and unintentionally causing harm. In reflecting on the influences of other people, it is also important to remember the principle in Yoga of ahimhsa, non-harming, and the value of cultivating love for all, as we all arose from the same one source. Some Theists or Religionists have a world view that theirs is the only valid way of living, that they are right and everybody else is wrong. If you do not see reality their way, then you are a sinner and are going to burn in hell. The fear being talked about here is not just the fear, for example, of what "God" may do to you for your failing to follow the rules of the religion (though that fear may have also been programmed into you at a deep level). Rather, it is a subtle, often unnoticed, ever present fear of the religious institutions and their human representatives and followers themselves who want you to follow them. It is a fear that creeps not only into your worldly activities with other people, but also into the recesses of your unconscious mind, where it can become a block to your spiritual life. As if that is not enough, there is a growing presence of Atheists or Secularists who decry all spiritual practices as being irrational and a waste of time. Some of these people are completely convinced that all nature of consciousness emerges solely from matter. If you are not a pure, one hundred percent materialist, you are perceived to be an ignorant Religionist of the most extreme fundamentalist type. The fear is not based on the atheistic possibility of there not being an afterlife, that you will finally, irreversibly no longer exist in any form. Rather, it is a fear of the people themselves, resulting from their rejection of both you and your views, along with an argument that you should disbelieve any metaphysical experiences you may have had, and abandon your seeking of anything higher or deeper. If either of these types of people, Theist or Atheist, are present in your family, social and career worlds, the unspoken (or spoken) pressure to conform, follow, or convert to their views can be a tremendous threat to your sense of well being, both in terms of emotional response and the realities of functioning in a world of such people. This fear can have a devastating effect on ones feelings of safety in family, community, and professional life, and, in turn, on spiritual life. It can cause hesitancy, timidness, reluctance, mistrust, self-doubt, and other such emotions and reactions, which are often projections of an underlying fear. These, in turn, are antagonists to the tranquility or peace of mind consistent with meditation and other spiritual practices. In America, the fifty states are spoken of as either red states or blue states, based on political party dominance. The two colors also represent religious polarities of conservative or liberal. Imagine for a moment that there were a third category, which we can call violet states, which would be those where the Yogis and Mystics are in the majority. How many violet states are there? None. The balance of blue states and red states may shift slightly from time to time, but there remain no violet states. If you are red oriented you can easily visit or live in a red environment. If you are blue oriented you can easily visit or live in a blue environment. However, if you are violet oriented there is no state in the U.S. where you can go where you are anything other than a minority. As is often the case with minorities, the stage is set for fear. So, if you think of yourself as a Yogi, Mystic, or Gnostic seeker, you are extrinsically and subliminally pressured from two directions. One is the Theistic Religionists who say you are evil or damned Atheists, and the other is the Atheistic Secularists who say you are misguided or confused Religionists. You may intuit the all-pervading Reality rather than only some one, single overseer of the world, contrary to the Religious Theist. You may intuit that matter manifests from consciousness, rather than vice versa as seen by the Secular Atheist. In either case, you may find yourself feeling alone, confused and suffering deeply, or at best, feeling yourself to be in a miniscule minority. In response to this unnoticed fear, you may find yourself speaking in hushed tones when talking with others about subjects like meditation. If a conservative Religious Theist walks in the room, you may lower your voice or change the subject of conversation. You may look around to see who is watching or listening before starting a conversation about the inner contemplative journey. Similarly, you may find yourself suddenly become either very quiet or verbally evasive in the presence of a self-declared Secular Atheist. You may have learned over many years that it is safer to just remain silent, to keep your experiences and perspectives to yourself. The fear we are talking about here is not a clinical paranoia, but a low level, pervasive fear that may otherwise be having little effect on your daily life, as might be the case with a medically diagnosable paranoia. However, you may find yourself longing for a "community" of "like minded" people, while often feeling alone and not having such a close network of friends and fellow seekers. You may read books, but never have anybody to talk with about them, or with whom you can share your insights or ask your questions. You may meditate or do other practices, but still feel a vague sense of incompleteness that you do not understand. Theistic Religionists can be quick to label Yogis and other Mystic seekers and organizations as cult followers or cult organizations. They describe the methods of cults as including being emotionally and financially exploitive, psychologically manipulative, demanding of unquestioning dedication or devotion, requiring suspension of critical thinking, and other such means of control. Ironically, it is these very kinds of practices that the Yogi or Mystic may see in the Theists and their organizations. Not knowing quite how to deal with this in work or social settings, the Yogi or Mystic may end up with an internalized fear which may not be recognized as having an unconscious influence over one's own spiritual practices and life. Does any of this sound familiar to you? If so, you may be carrying around this kind of inner baggage of fear and having it negatively impact your spiritual practices and life. It often manifests as feeling you "do not have time" to meditate or do other practices, as if some invisible force is blocking the path in front of you. It can manifest as feeling you are "not ready" to go ahead on the journey. It can feel like you are "not worthy" to have the joy of direct experience of your own true nature. It can leave you "deciding" to follow the inner journey later in life, maybe after you have a different circle of friends, after you have moved to a different city, after your children are grown, after your relationship with your spouse has changed, or after you retire from your job. No teacher, no method, no class can deal effectively with this, without seeing clearly the nature of this pervasive fear-filled obstacle, and without having a resolute commitment to see it, explore it, accept it, and not let it prevent you from doing your meditations, contemplations, or other spiritual practices. The suggestion of Patanjali in the Yoga Sutras that these obstacles be dealt with by one-pointed training of mind may lead to feeling even more hopeless because of feeling you "cannot do it," although this ability to stay focused is ultimately seen to be extremely important and useful. The Theists or Religionists have found or created a very broad range of communities of peers with whom they can relate and provide support for one another. So too, the Atheists and Secularists have increasingly found or built communities for supportive relationships. Surely, some practitioners of Yoga and Mysticism have found or have formed small, supportive communities. Of those, some have encountered and dealt with the fear being talked about here. However, there are many, possibly millions of sincere seekers with lesser experience and exposure who have neither discovered and dealt with the fear, nor found any supportive community where they can openly explore and transcend this very subtle, powerful obstacle. They are quietly suffering alone in an unseen fear of both the Theists and Religionists, and the Atheists and Secularists, who are by far in the majority amongst their neighbors, coworkers and family members. If you are a sincere seeker of direct experience, it is imperative to see the nature of this fear so that you can develop the will power, the sankalpa shakti, the determination to move forward, right through the middle of these obstacles, regardless of the opinions and actions of your fellow humans, whether Theists or Atheists. This is done by cultivating an active, passionate conviction to seek that for which your heart longs. With this awareness and commitment, and an attitude of loving perseverance, the fear is ultimately seen as a phantom and gradually dissolves into just one more past habit that no longer binds, or blocks the finer realization being sought. Chicago Tribune writer Julie Deardorff recommends the Yoga Nidra CD of Swami Jnaneshvara (ISBN 0972471901) for dealing with insomnia (point #2 of 3 in her article below). Working mothers trying to "do it all" have the most serious episodes of insomnia, while stay-at-home moms are most likely to sleep poorly, according to the National Sleep Foundation's 2007 Sleep in AmericaPoll. The main culprits are young children, biological changes like pregnancy and menopause, stress and pets. I had my first extended bout with insomnia during what should have been a triumphant period of motherhood: right when my oldest child started sleeping through the night. Now, with a 3-month old and a toddler, I don't even try to get sleep. And I don't worry when I still haven't fallen asleep by 2 a.m. and I've just calculated that the most sleep I can get is four hours. Instead, I do damage control the following day. Exercise is one of the first things to go when women have too much in their day, the study showed, but I use it for a short-term jolt, like caffeine. Normally, I get on the treadmill, do a slow, warm-up mile and then punish myself for about 15 minutes with either speed or hills. The only requirement is that I break a sweat. Then I run easy for a cool-down mile. Unfortunately, you'll have to try this at your own risk. When I began looking at research on this, it showed that exercise can actually make you feel worse when you're sleep deprived and can be dangerous. Your coordination goes when you're tired and you actually fall off of the treadmill. Also, if your body doesn't have time to repair during sleep, you're more likely to get injured. Still, it's how I've been able to work full time despite getting up at least two times a night to nurse. After an intense workout, my head clears and I can focus and get through the day. Yoga Nidra means "Yogic Sleep" and it's considered a state of conscious deep sleep. But it's not meditation, which leaves you in the waking state of consciousness, says Swami Jnaneshvara Bharati, who produced the audio CD "Yoga Nidra Meditation CD: Extreme Relaxation of Conscious Deep Sleep." Instead, during Yoga Nidra, you "leave the waking state, go past the dreaming state and enter into deep sleep, all while remaining fully alert and awake," Bharti says. Reaching this state of awareness is easier said than done, of course. To this day, I haven't been able to stay awake through an entire Yoga Nidra CD, which can last between 20 and 60 minutes. To do it, lie on your back as if in shavasana or corpse pose, with your eyes closed and your palms facing up. If you've got Bhrarti's verbal CD--there's no music--he'll tell you to focus your awareness on 61 points within the body. For example, he'll tell you to bring your attention to your left hand, your pinky finger, your ring finger, your middle finger, your index finger and your thumb. The entire body is scanned in this way until the heart center is reached. Some swear the process can replace sleep. Others with insomnia use it to help them relax so they can go to sleep. The old standby works because it blocks a certain receptor in the brain that releases a neurotransmitter called adenosine. Adenosine makes us sleepy and if the release of it is prevented, you won't feel quite as tired. The trick is to avoid using caffeine every day. Only people who avoid it for a while feel a buzz , according to a University of Bristol study presented to the British Nutrition Foundation Conference. "We do feel a boost from caffeine in the morning, but that's probably due to a reversal of the withdrawal symptoms," researcher Peter Rogers, a biological psychologist told the BBC. "That alertness you feel is you getting back to normal, rather than to an above normal level." All sadhanas, all practices, are meant to purify and strengthen the mind that disturbs your being and prevents you from being aware of the Reality that is within you. To be spiritual means to be aware of the Reality all the time, to be aware of the Absolute Truth all the time, and to be aware of the Lord within you all the time. Guru is not a person, but guru can be represented in a person. One who has developed his or her own spiritual awareness to a very high level can guide others, and is considered to be guru. Only one who is finely attuned to the inner guide can inspire the awakening of the inner guide in another. Guru is not a physical being. If a guru begins thinking this power is her or his own, then they are no longer a guide. The guru is a tradition, a stream of knowledge. In India guru is a sacred word that is used with reverence and is always associated with the highest wisdom. The guru is unique in a person's life. The relationship between disciple and guru is like no other relationship. It is said that guru is not mother, father, son, or daughter. The guru is not a friend in any conventional sense. It also is sometimes said that the guru is father, mother, son, daughter, and friend all in one; the guru is sun and moon, sky and earth to the disciple. The truth is that the relationship of guru to disciple is indescribable. The relationship extends to the realm beyond the world, transcends death, and stretches far beyond the limited karmic bonds associated with family and friends. A mother and father help sustain the body of their child, and nurture and guide the child through the formative years of life to adulthood. Guru sustains, nurtures, and guides a soul through lifetimes to ultimate liberation. The relationship with the guru is based on the purest form of unconditional love. There is complete openness with the guru. The disciple should hold nothing back from the guru. This is why in the tradition, a student goes to the guru and offers a bundle of sticks to burn. The bundle symbolizes that everything the disciple has is offered unconditionally to the guru. Everything is offered to the guru so the guru can do the work of shaping the student spiritually. The disciple comes with full faith and entrusts his whole life to the guru. The guru takes that life and chops it and burns what is not necessary, and then carefully carves what remains into something sacred. In this chopping and burning, the guru is merciless. The guru's job is not to hold hands with the disciple and wipe away tears, but to cut into pieces the disciple's ego and all that stands between the disciple and freedom. The guru does not allow dependence. If the disciple becomes too dependent on the guru, the guru pushes the disciple away, insisting on independence. It is a remarkable expression of the deepest love. Yoga Nidra is not a practice of autosuggestion or verbal affirmations, whether affirming desired personal qualities or worldly objects that are desired. It is also not a process of verbally affirming that you are in Yoga Nidra. If you are still in such a conscious level that you are still making oral affirmations of any kind, then you are definitely not in the subtle state of Yoga Nidra. In such a case, the conscious, Waking state mind has not yet receded into the cause from which it arose. 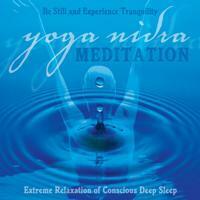 Yoga Nidra means Yogic Sleep. It is a state of conscious Deep Sleep. In Meditation, you remain in the Waking state of consciousness, and gently focus the mind, while allowing thought patterns, emotions, sensations, and images to arise and go on. However, in Yoga Nidra, you leave the Waking state, go past the Dreaming state, and go to Deep Sleep, yet remain awake. While Yoga Nidra is a state that is very relaxing, it is also used by Yogis to purify the Samskaras, the deep impressions that are the driving force behind Karma. (See also Yoga Nidra article and Karma article). Yoga Nidra brings an incredible calmness, quietness and clarity. Yoga Nidra is one of the deepest of all meditations, leading awareness through many levels of mental process to a state of supreme stillness and insight. With patient and thorough reading [of the Yoga Nidra article], the understanding is well worth the effort, allowing you to see the profound depth of Yoga Nidra, which is far beyond just relaxation. It is said that a picture is worth a thousand words. Sometimes it takes thousands of words to get the inner "aha" of the meaning. Most important of all, it is the persistent practice that brings the real joy of the practice of Yoga Nidra, as with all useful practices in life and Yoga. Yoga is increasingly being practiced by Christian people of the world, particularly in the West. While it is easy for critics to argue that the two are incompatible, many people intuitively know that Yoga, which is not a religion, and Christianity really are quite compatible. Actually, principles of Yoga are already contained within Christianity and Christian meditation. To say that Yoga is compatible with Christianity is not to say that that the two are the same. Compatibility and sameness are two very different principles. In addition, it is important to note that there may be individual denominations opposed to Yoga practices with body, breath and mind, just as there are individual denominations opposed to medical treatment, modern technology, or a variety of social and cultural activities. However, the fact that some denominations are opposed, and thus incompatible with Yoga in their individual view, does not mean that the whole of Christianity is incompatible. While some critics of Yoga say that it is not compatible with Christianity, there is already tremendous diversity of opinions and practices within the Christian religion, which serves a broad variety of people. The World Christian Encyclopedia (pub. 2001) is quoted as estimating that there are over 28,000 Christian denominations (later updated to 33,830 and 39,000 according to different sources). The World Christian Database says that over 9,000 denominations are represented in its database (2004). Another Christian resource on the Internet says that the number of Christian denominations has increased to over 35,500 from approximately 1900 denominations that existed a hundred years ago. If there is room for tens of thousands of denominations within Christianity, surely there is plenty of room for Yoga to be practiced by its adherents who choose to do so. It is very useful to be aware of the polarities of Esoteric and Exoteric religion. Many of the people practicing Yoga are drawn to the Esoteric end of the spectrum, which is the domain of mysticism. Throughout human history the Esoteric practitioners have been shunned by the more Exoteric people. Thus, it is not only Yoga that some Christians are opposed to, but also the the mystical practices of their own religion. In such cases, Yoga is a convenient, visible target, while the effort is actually one of attempting to suppress the subtler essence of their own roots.